How to get a favor of your colleagues? 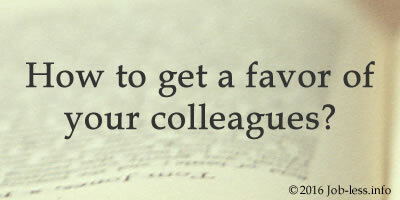 Article #7: How to get a favor of your colleagues? Co-workers send sideways glances to your address; nobody talks and even suggests drinking a cup of coffee together. You feel that the collective absolutely doesn't sympathize with you. Marie Jordan learned how to improve the relations with fellow workers. "You shouldn't wait while somebody will suggest you to drink coffee, to smoke or to go together to have a dinner", - the trainer-consultant of the "Solo" company Dan Kinski explains. "Take an initiative and, coming to a smoke break or a lunch break, take an interest may be someone is going to join you". If there is a tradition to celebrate together personal holidays of employees in your collective, think up an occasion (the successful completion of the session, birthday of your child or simply the excellent purchase) which would allow you to bring colleagues together at the holiday table. Remember, there is nothing that brings us together and unites as an informal atmosphere. Bring for work, for example, the homemade pie and treat with it your colleagues. If you don't possess special culinary talents, better buy the same pie or cake in a reliable confectioner's shop. "This means "will sweeten" the attitude of people around towards you", - Dora Hamilton, the psychologist of the center "APA", advises. Probably, not all fellow workers understand your jokes. Therefore to avoid unpleasant situations, try not to release "causticities" towards people surrounding you. More often pay compliments to colleagues, but in no circumstances play the hypocrite. If people feel that you aren't insincere in your words, the situation can only get worse. It is better to say co-workers that you really like about them. "Be yourself not only at home, but also on a workplace. Because people around feel when the person plays for the public", - the head of recruitment company "Staff Service" Luiza Thompson assures. "People will always estimate if you are honest and straightforward with them".